This article is about one of the five major circles of latitude. For other uses, see Arctic Circle (disambiguation). The word arctic comes from the Greek word ἀρκτικός (arktikos: "near the Bear, northern") and that from the word ἄρκτος (arktos: "bear"). The Arctic Circle is the southernmost latitude in the Northern Hemisphere at which the centre of the sun can remain continuously above or below the horizon for twenty-four hours; as a result, at least once each year at any location within the Arctic Circle the sun is visible at local midnight, and at least once the centre is not visible at local noon. Directly on the Arctic Circle these events occur, in principle, exactly once per year: at the June and December solstices, respectively. However, because of atmospheric refraction and mirages, and also because the sun appears as a disk and not a point, part of the midnight sun may be seen on the night of the northern summer solstice up to about 50 minutes (′) (90 km (56 mi)) south of the Arctic Circle; similarly, on the day of the northern winter solstice, part of the sun may be seen up to about 50′ north of the Arctic Circle. That is true at sea level; those limits increase with elevation above sea level, although in mountainous regions there is often no direct view of the true horizon. Only four million people live north of the Arctic Circle due to the climate; nonetheless, some areas have been settled for thousands of years by indigenous peoples, who today make up 10% of the region's population. Tens of thousands of years ago, waves of people migrated from eastern Siberia across the Bering Strait into North America to settle. The largest communities north of the Arctic Circle are situated in Russia, Norway, and Sweden: Murmansk (population 295,374), Norilsk (178,018), Tromsø (75,638), Vorkuta (58,133), and Kiruna (16,936). Rovaniemi (62,667) in Finland is the largest settlement in the immediate vicinity of the Arctic Circle, lying 6 km (4 mi) south of the line. In contrast, the largest North American community north of the Arctic Circle, Sisimiut (Greenland), has approximately 5,000 inhabitants. Of the Arctic communities in Canada and the United States, Utqiagvik, Alaska is the largest settlement with about 4,000 inhabitants. The Arctic Circle is roughly 16,000 km (9,900 mi) long. The area north of the Circle is about 20,000,000 km2 (7,700,000 sq mi) and covers roughly 4% of Earth's surface. The Arctic Circle passes through the Arctic Ocean, the Scandinavian Peninsula, North Asia, Northern America, and Greenland. The land within the Arctic Circle is divided among eight countries: Norway, Sweden, Finland, Russia, the United States (Alaska), Canada (Yukon, Northwest Territories, and Nunavut), Denmark (Greenland), and Iceland (where it passes through the small offshore island of Grímsey). The climate inside the Arctic Circle is generally cold, but the coastal areas of Norway have a generally mild climate as a result of the Gulf Stream, which makes the ports of northern Norway and northwest Russia ice-free all year long. In the interior, summers can be quite warm, while winters are extremely cold. For example, summer temperatures in Norilsk, Russia will sometimes reach as high as 30 °C (86 °F), while the winter temperatures frequently fall below −50 °C (−58 °F). ^ "Obliquity of the Ecliptic (Eps Mean)". Neoprogrammics.com. Retrieved 13 May 2014. ^ Berger, A. L. (1976). "Obliquity and Precession for the Last 5000000 Years". Astronomy and Astrophysics. 51: 127–135. Bibcode:1976A&A....51..127B. ^ Liddell, Henry; Scott, Robert. "Arktikos". A Greek–English Lexicon. Perseus Digital Library. ^ Liddell, Henry; Scott, Robert. "Arktos". A Greek–English Lexicon. Perseus Digital Library. ^ Marsh, William M.; Kaufman, Martin M. (2012). Physical Geography: Great Systems and Global Environments. Cambridge University Press. p. 24. ISBN 978-0-521-76428-5. Wikimedia Commons has media related to Arctic Circle. 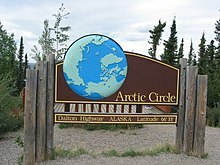 Look up arctic circle in Wiktionary, the free dictionary.